Scribbler has over 30 years experience of creating funny greeting cards, and today is going stronger than ever as one of the UK’s leading supplier of greeting cards. With same-day despatch and a plethora of customisation options available, it’s no small wonder Scribbler has gained such nationwide popularity. Whether it’s a birthday, mother’s day, a congratulations, commiserations, a new baby, or just to say, Scribbler has an amazing range of cards for all occasions. From the adorable to the droll to the downright outrageous, Scribbler has a range of wonderful cards designed to amuse even the most discerning of recipients. With the majority of their hilarious cards able to be personalised, you can show a special someone you really care about them with a well-thought-out customised card from Scribbler. Whatever their sense of humour, you can find the right card for them, with thousands to choose from, so give their funny bone a workout with Scribbler. How do I use my Scribbler discount code? Sign up to Scribbler’s newsletter for regular news and deals, as well as some occasional frivolous silliness. Do Scribbler offer a student discount? Scribbler offers a 20% discount for all students and all those aged 16 - 26 with YouthDiscount. Do Scribbler have physical UK stores? Scribbler have dozens of stores around the UK. To find the closest one to you, see here. Do Scribbler offer free delivery? 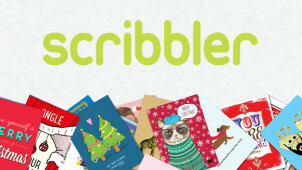 Scribbler offers free first class delivery on all orders of 2 or more cards! Standard 1st Class Delivery costs 60p, or is free if you order 2 cards or more. Scribbler offers a range of other delivery options, varying in price depending on your order size. See here for more details. As Scribbler cards are personalised, they only accept returns on products which are damaged or faulty. Returns must be initiated within 28 days of delivery. To find the hours of your local store, click here. We’ve all given and been given a fair few lacklustre greeting cards in our time, and nobody wants to be on the receiving end, luckily with Scribbler’s amazing range of personalised cards, mediocre cards are a thing of the past. With a great range of hilarious, heartfelt and humorous cards, pick up a Scribbler discount code today and get someone a greeting card that will stand out from the crowd. From birthdays to engagements to father's day, there’s a card for every occasion at Scribbler. Although Scribbler prides itself on its witty selection of rude, outrageous and hilarious greeting cards, it also stocks a wide range of age-appropriate cards for kids of all ages. From humourless newborns to those starting to inherit their dad’s amazing sense of humour, Scribbler caters to all ages. What’s more, using the easy-to-use content filters on their site, you can keep your little ones safe from any of Scribbler’s content you might deem inappropriate. When February 14th starts looming closer, take a look at Scribbler’s wicked range of Valentine’s Day cards, to remind your significant other how important they are to you whilst simultaneously giving their funny bone a tickle. With a Scribbler voucher code you can save a pretty penny on the cost of one of these hilarious cards, meaning you can shell out more on fancy chocolates or an expensive restaurant. From the cute and charming to the downright scandalous, Scribbler have a comedy card to fit all tastes.